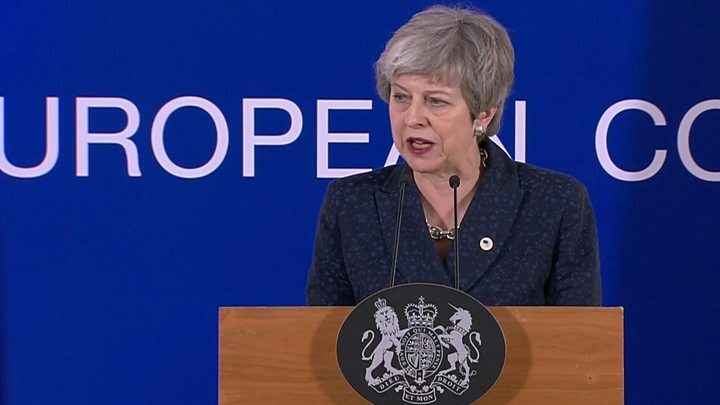 Media captionTheresa May: "I hope we can all agree we are now at the moment of decision"
He added that the atmosphere was "much better than I had expected" among EU leaders in discussions and he was now "much more optimistic". Image caption What will EU leaders do if UK MPs reject the deal for a third time? It's been clear for some time that EU leaders were prepared to offer a short extension of the Article 50 process. But there have been different views about how long "short" should be. If the UK doesn't take part in European elections, a strict interpretation of the law rules out an extension until the end of June, which is what the Prime Minister had initially requested. That's why the 27 EU leaders offered a possible extension until 22 May, the day before voting in the elections begins. Such an extension is only on offer, though, if UK MPs vote for the Brexit deal in the House of Commons next week. And EU leaders know the numbers there don't look good for the government. So the legal and political calculations that surround the EU's offer are complex, and the outcome is difficult to predict. But one thing is clear - barring dramatic developments, it confirms that the UK will not be leaving the EU on 29 March as originally intended.